Today, the 21st of August marks 100 years since the death of an incredible young man, Captain George Ainslie, MC of the Kings Own Scottish Borderers. 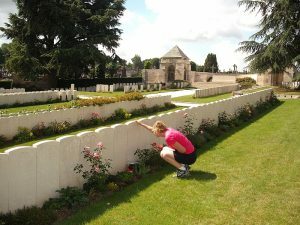 Of course, over the past four years, we have found ourselves commemorating the lives and loss of so many incredibly brave young men and pondering how their unique skills and abilities, demonstrated on the battlefields of France and Flanders, could have been used more constructively in peacetime. How many truly great political leaders, scientists, authors and humanitarians did Britain, France, Germany and the other countries involved lose as a result the needless slaughter of 1914-1919? While we know that many such as Wilfred Owen, John Kipling and Rupert Brooke would have been destined for higher offices in our post-war due to their social status we also know that society was less rewarding to those of a less entitled background. And yet the war threw up so many examples of young men from working families across Britain who demonstrated an incredible degree of leadership or morality when they were given the opportunity to lead. It is a pity that British society was not ready to recognise a person’s natural leadership abilities on merit alone and not on which posh school they attended. Perhaps we have yet to fully learn this lesson. This was the situation that applied to George Ainslie. A young man from a family of farm workers from Berwickshire who joined up and who was perhaps destined to serve his time as an infantry soldier with his local regiment – The Kings Own Scottish Borderers. And yet, despite increasing odds he survived through repeated battles. A combination of increasing recognition by senior officers of his skills, and the continuous loss of the anointed officer class led to him becoming an officer, earning a Military Cross in battle and being appointed to the rank of Captain. It is tragic that after surviving so long that he died with the war only three months from the end. A battle too many and he suffered wounds which he survived for only a few days and, despite medical attention, he finally succumbed to in a Field Hospital in St Omar 100 years ago today. Today he lies at rest in the Longuenesse Souvenir Cemetery outside the beautiful Northern France town of St Omer. George Ainslie was the second oldest child of Thomas Davidson Ainslie and his wife Mary Skeldon. Thomas was born in Kirk Yetholm in 1867 and according to family folklore, the Ainslie’s have some link with the famous Yetholm gypsies although I have yet to be able to prove any such connection. Thomas’s father, Adam Ainslie, was already in his 60s when Thomas was born. He had raised a family of Ainslie’s before his first wife, Elspeth died. In 1856 at Alwinton, Northumberland, Adam married Jane Anderson who was from the English side of the Border. The family settled around Yetholm where Adam worked as a flesher and Thomas and his two siblings were born. As would be expected, Thomas left school as soon as possible and became a farm servant. In 1892 he was living and working at Mersington, Eccles, Berwickshire as a farm servant when he married Mary Skeldon, herself a farm servant’s daughter from nearby Kames West Mains Farm. Thomas and Mary settled in Eccles and their firstborn son, Adam, arrived two years later in 1893. George Ainslie was born on the 14th May 1894 at Mersington. The family continued to grow in the 1890s with two girls – Rebecca and Mary Jane – added. Thomas must have been a reliable worker as he stayed on at Mersington until at least 1896 when Rebecca, my wife’s great-grandmother was born. The norm for farm servants and their families was a constant re-negotiation with farmers of their employment terms. The farmer always held the upper hand leading to frequent moves from farm to farm and a life of uncertainty. 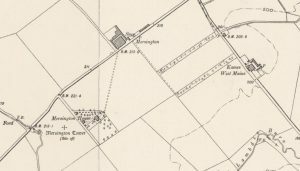 The beginning of the 20th century found the family had moved a very short distance to the farm of East Printonan, Eccles. In the 1901 Census George was 6 years of age and was attending the local school. The last Census available to us in Scotland, the 1911 Census, finds the family still at East Printonan. Thomas is now working as a farm grieve. This was the equivalent of a farm worker’s supervisor and a grieve carried power and influence amongst the farm workers, acting on behalf of the farmer. Thomas’s consistency showed that he must have been viewed as being a reliable worker. By 1911, George Ainslie was 16 years of age and would have been in employment for the past 3-4 years. He is shown as being a groom, clearly indicative of a skill with horses. Was this a factor in his future success as a soldier? In August 1914 the Great War broke out. 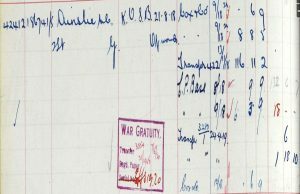 George’s war record has not survived but he initially joined the 2nd KOSB. The records show that his date of entry to the War Theatre of France was 30th August 1916. 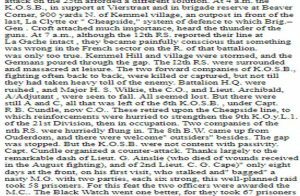 We know that the 2nd KOSB was a battle-hardened unit that had been part of the original BEF. It had just been involved in the initial stages of the Battle of the Somme, around High Wood. George would have been introduced to conflict in late 1916 on the Somme and in April 1917 they moved to Vimy Ridge where they took part in the famous battle where the Canadians, supported by British Units, seized the ridge but with heavy losses. George clearly must have impressed the officers at Vimy Ridge as he was elevated to Sergeant and on the 21 June 1917, less than a year after his deployment to France, he was commissioned as an officer and appointed to the 6th KOSB. The 6th KOSB was part of the 27th Brigade of the 9th Scottish Division. From June 1917 George would have led his soldiers through the mud of Passchendaele, also known as Third Battle of Ypres and early in 1918 in the Battles of St Quentin and Bapaume. 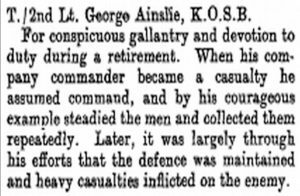 George Ainslie and 2nd Lieutenant Cape were both awarded the Military Cross for “conspicuous gallantry”. The citation, published in the official London Gazette on 26 July 1918, is shown below. The London Gazette also reported on the 11 July that temporary 2nd Lt G Ainslie, MC was to be made Acting Captain and commanding a Company. This was effective from 25 April 1918 when he earned his Military Cross at Kemmel. A Company would normally number over 200 soldiers although by this stage of the war the numbers may be less. However, it is a considerable achievement for the son of a farm servant from Berwickshire and an indication of his natural leadership skills and undoubted bravery. Sadly for George, his luck ran out in August 1918. As the allies pushed forward hoping to finish the Germans, the 6th KOSB took part in an attack at Hoegenacker Mill on the 18th August 1918. The assault was a success and the 6th took almost 100 German prisoners. However, they lost 7 officers and 25 killed and 4 missing. 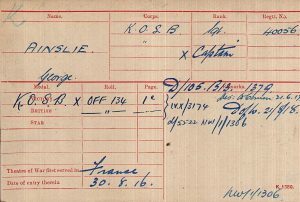 George Ainslie was injured and removed to a Field Hospital in St Omer where he died three days later on the 21st August 1918. The army was renowned for its bureaucracy and one of the most tragic records is the Army Register of Soldiers Effects which lists outstanding payment due to a soldier, outstanding debts (including the cost of uniform for officers) and what, if anything, was finally paid to the next of kin. The record for George is shown above. The transfer of payments continued well after George had died as shown from the record above. 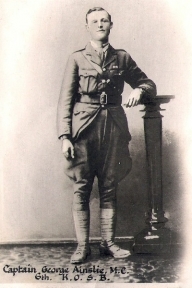 Today George Ainslie is commemorated on the War Memorial at Swinton, Berwickshire and also on his parent’s headstone. Thomas Ainslie died in 1936 at the age of 68 and George’s mother Mary Skeldon was 73 years of age when she died at Kelso, Roxburghshire in 1942. 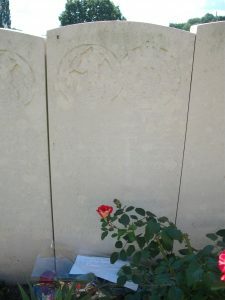 George Ainslie was laid to rest at Longuenesse (St Omer) Souvenir Cemetery, France. Like many young men, George died without any immediate descendants and it has been up to his extended family to keep the flame of his memory alive. It is pleasing to be able to record that the extended Ainslie and Denham families have done this successfully. My wife Julie, was brought up learning about her Uncle George Ainslie, largely from her Papa, Sandy Denham. In 2011, during a family holiday in Northern France we made the journey to St Omer to pay our respects to this young man who at the age of only 24 years of age had demonstrated an unbelievable level of leadership and bravery. It was a moving experience, not least for my daughter Emma, who will carry the story of George to her descendants. George went from being a farm servant, working in Berwickshire to joining the conflict in France in 1916, immediately after the horror of the Somme. Despite his young age and relative inexperience he clearly demonstrated a level of natural leadership, beyond his years, earning him quick advancement to Sergeant and an officer commission within the year. He proved that leadership at Mont Kemmel and at the fateful attack on Hoegenacker Mill. Thank you for posting the article about my uncle George. My father, William,was brother to George and my Aunt Beck. I had done a lot of research, as had my Dad before me, and produced info on the family tree. Hi Tom and Ian, Thank you for your comments on the blog on George Ainslie. It is a fascinating story of how he went from being a Private at the start of the war to an officer and you wonder how well he would have done after the war had he survived. My wife is Julie Nairn, daughter of Billy and Margaret Nairn from Duns who I know you both know well. I have done some work around the Denham/Ainslie family and happy to share this. Likewise, Tom, if you have any additional information on the family history then I would be delighted to receive copies of any information you may have. My wife’s papa, Sandy Denham was good for stories as you may know! I got some information from him and Margaret but you may have a got a bit more detail from your dad which will be helpful in keeping the family story together. My email should you wish to contact me is garylawrie@heartofscotlandancestry.co.uk. Thanks again. Who Was Your Ancestral Tam O’Shanter ?